Software development competences are becoming the new currency in many industries. As fierce competition forces companies to rapidly acquire or expand their software expertise, tooling issues are plaguing development teams. The old toolchain simply doesn't scale along. There is a need to lift the limitations of outdated, open-source, or otherwise inadequate tool environments. In order to provide a context and a toolchain for developers to work together efficiently, a growing number of companies are turning to Application Lifecycle Management platforms. 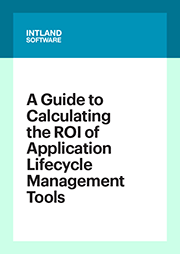 To help calculate the ROI and thus secure a budget for an ALM investment, this guide helps you quantify the benefits and consider all the cost factors of implementing integrated Application Lifecycle Management.